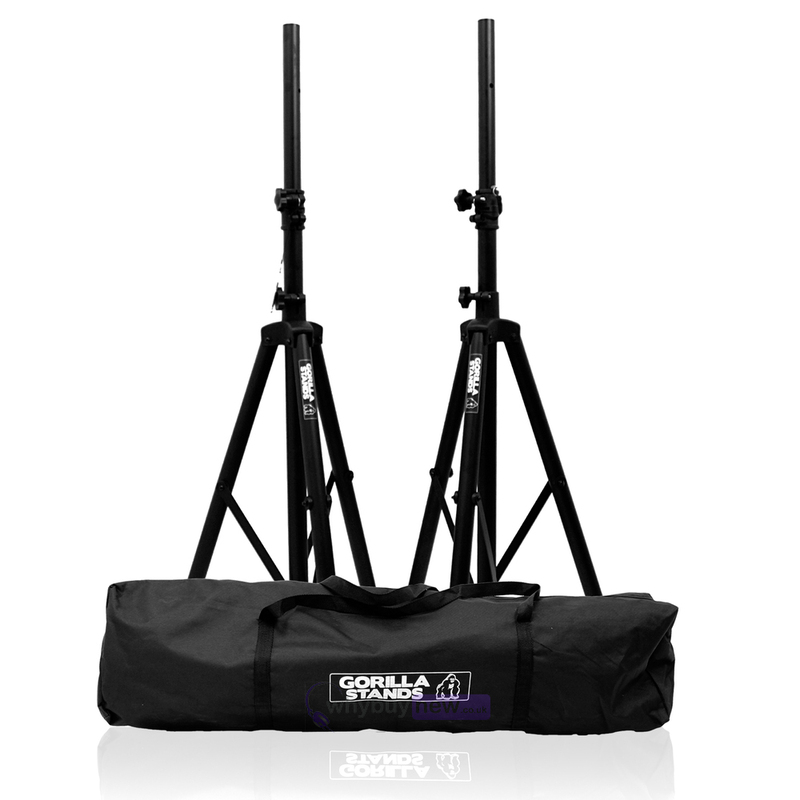 Here we have the Gorilla PA Speaker Tripod Stands Inc Bag in brand new condition and in B-Stock. The B-Stock versions would have been on display at a training evening or trade exhibition only and will come boxed 'as new' with all accessories and a 1-year warranty. Excellent service from WhyBuyNew as always. Product arrived quickly. I've had other speaker stands in the past, but these are absolutely solid, have a smart appearance to them and really do look the part. The Carry bag that is provided with these is easily worth around £15 itself and leaves room to throw in scrims and other things. 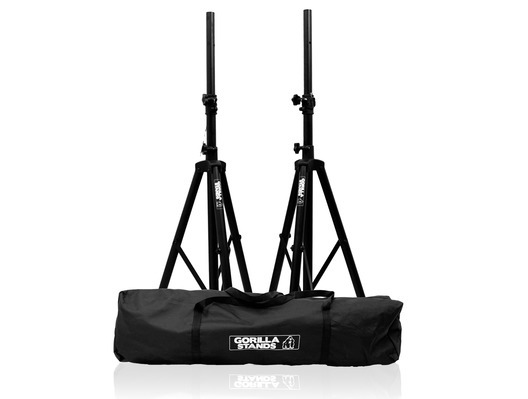 Great stand for the money, of course you get what you pay for these are not top of the range so dont expect that but for the money they are perfect for a second set which is what I use them for! Fab speakers Robust, and look good, at a very cheap price! Buy a pair noe! Brilliant! Look great and are very sturdy! Great price too. Looking forward to using them this weekend! bon produit même si j'ai une vis qui a foiré sous très peu de temps. bricolage logique et facile. Absolutely brilliant stands. Very sturdy and combined with the acrylic sheets you can get for these separate they do look very professional when using for events. Easy to transport and comes in a durable bag. Well worth the purchase. 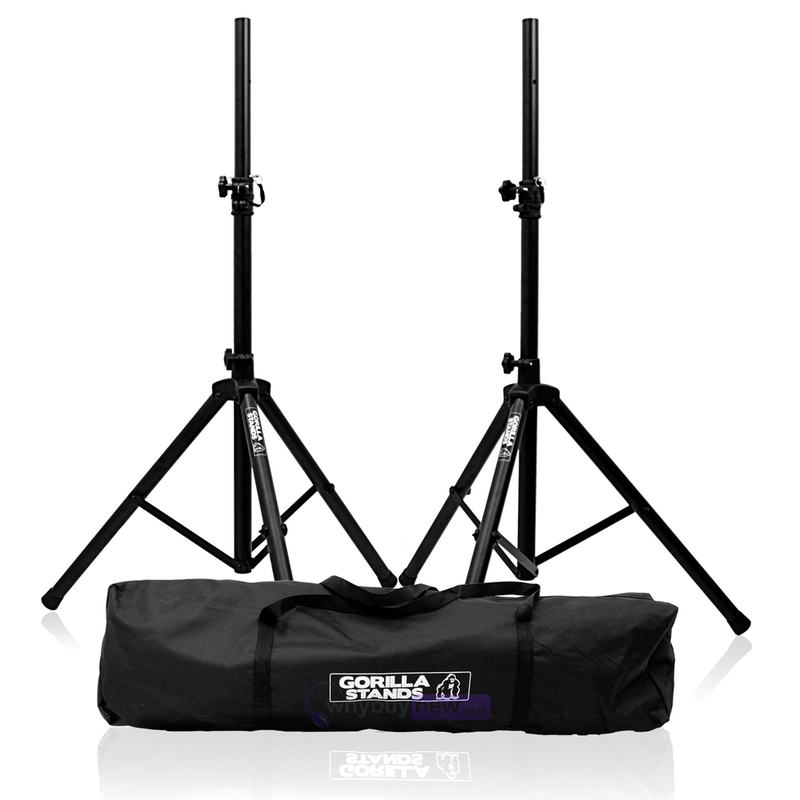 Good sturdy stands complete with carry bag, for this price, equals one great buy! Five star, excellent service. Really well made stand , light but solid, good safe extended height too. Good solid stand and worth every penny. The free carry bag is of same quality to other bags I've had which have lasted about 20 gigs before something ripping. Excellent robust but aesthetically inobtrusive. Good value for money. Solid stands at a bargain price. 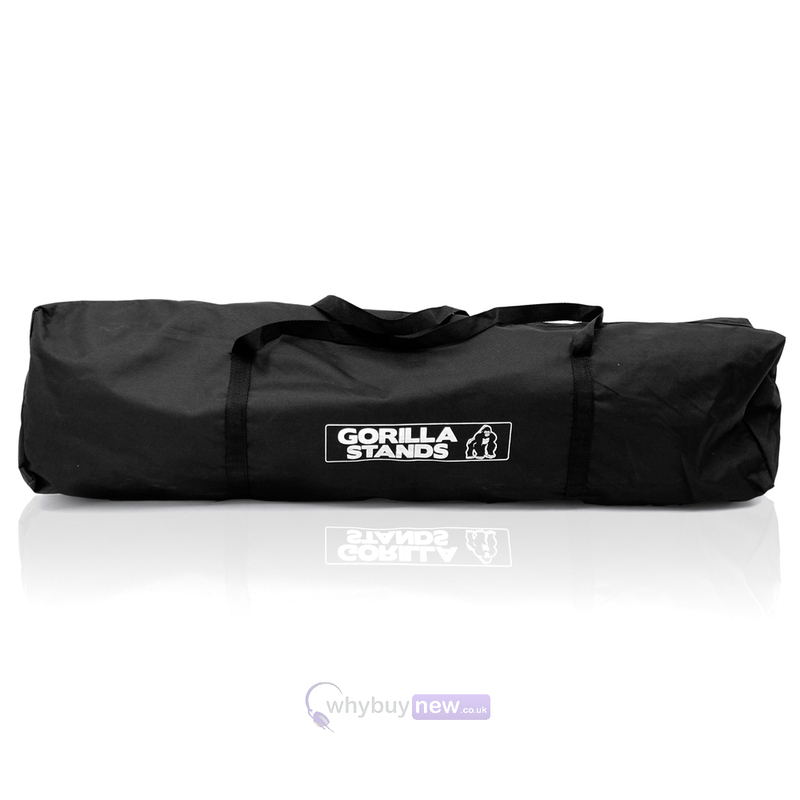 Very strong, easy to use and comes in a quality bag, great all round product. Great Bargain Price - Durable and perfect for use - cannot beat this brand and price for product! A Pair!! Perfect! Very firm with the supporting assessories. Good Price for Quality Product. Prompt Delivery Service through UKMAIL Carrier. Kojo. very good stands for the price nice and sturdy well made well recommended. Absolute bargain. These stands are really robust and sturdy. Had to buy a new set of stands after a rather drunk guest fell into one of my original ones at a gig and completely mullered it. Looked on here and glad I did. Well worth the money and the legs open out really wide making them so much more secure and sturdy than my previous set. As always great prices and service from Why Buy New. Thanks guys. Fantastic pair of speaker stands! Use them for all my gigs and never let me down! Lifetime warranty on them as well, the tightening knobs had worn out after a good 6 months of buying these stands and Whybuynew.co.uk sent out 4 brand new ones! Fantastic service as always! There is no doubt these stands can cope with anything thrown at them however the finish for brand new is not what is expected. Scratches and abrasions appears to be the norm. I know that within a short space of time they will attract these kind of wear issues but from new I expect pristine!! The first one was faulty, but credit to whybuynew they shipped a replacement the very next day, strong robust stand, I'm using the JBL Eon 15" Speakers (G2) there approx. 20.0 kg in weight and they hold them up no problem at all. Brilliant build quality as stated.. One slight issue as follows; safety bolt is slightly too thin and vibrates sometimes if you don't fasten up really tightly. Good product,great price,store easily and simple to use. Very good speaker stand. Very sturdy and strongly built. Highly recommend. Brilliant , very good price for such a quality product, very happy with this item . Very cheap but very very strong, would recommend them to anyone! 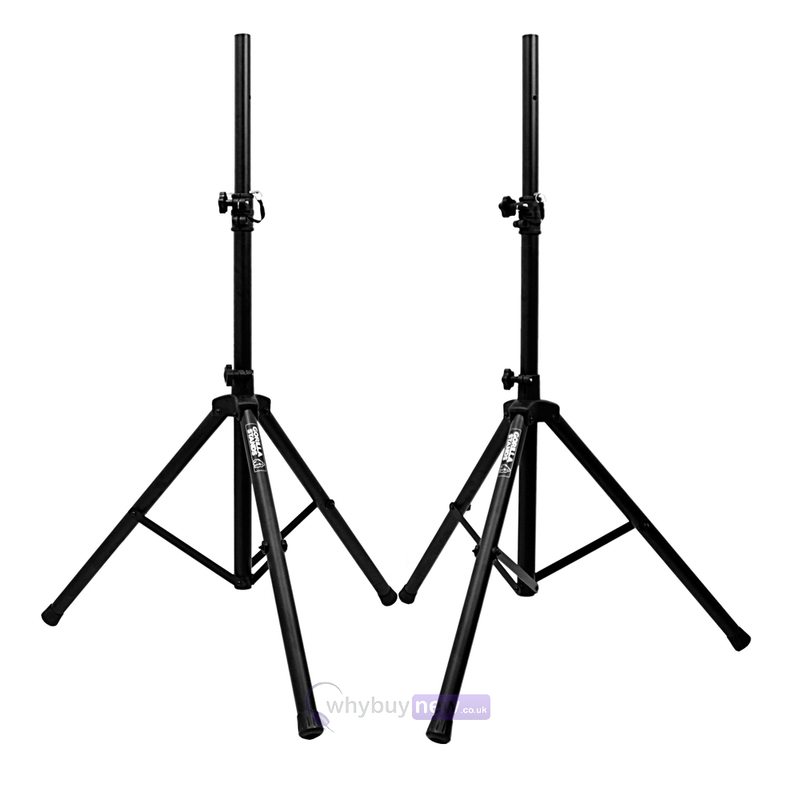 Amazing stands at less than half the cost of most PA speaker stand. Compact, Light, Solid and easy to set up. Comes with a holdall. Brilliant. Well done whybuynew! Robust and great value. Light and easy to store. Perfect! Solid quality stands at a bargain price.. Would buy more. 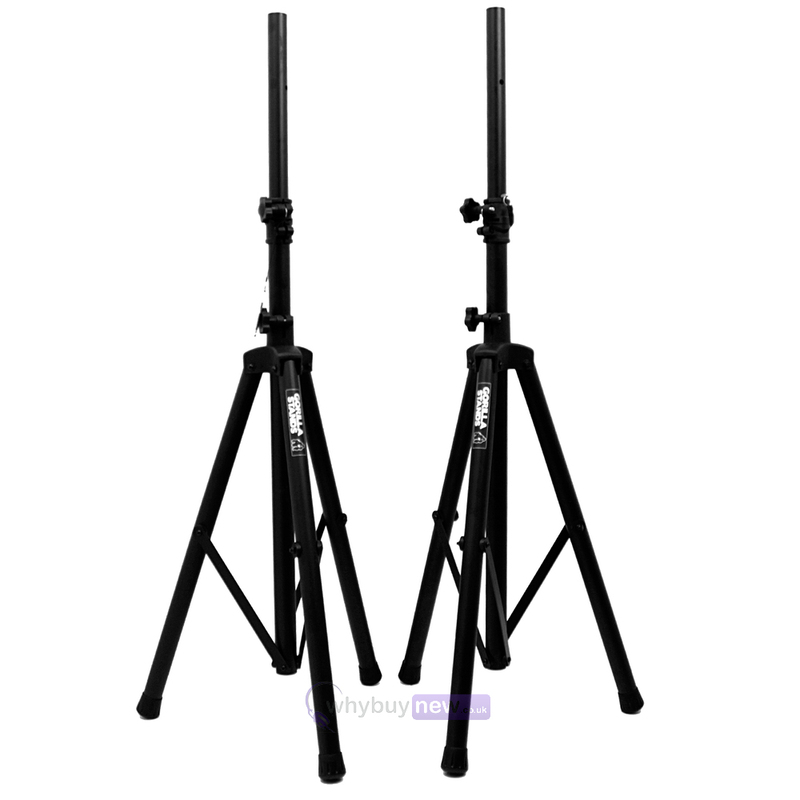 An excellent pair of tripod stands. very very sturdy and good height to them. Have used with some pretty big speakers and no worries with them at all. Top product for a low low price. Great stands, very sturdy and look the part. Locking pin of good standard. Fantastic value! Really pleased with the speaker stands, Smart appearance and light to carry, they are also easy to store away.